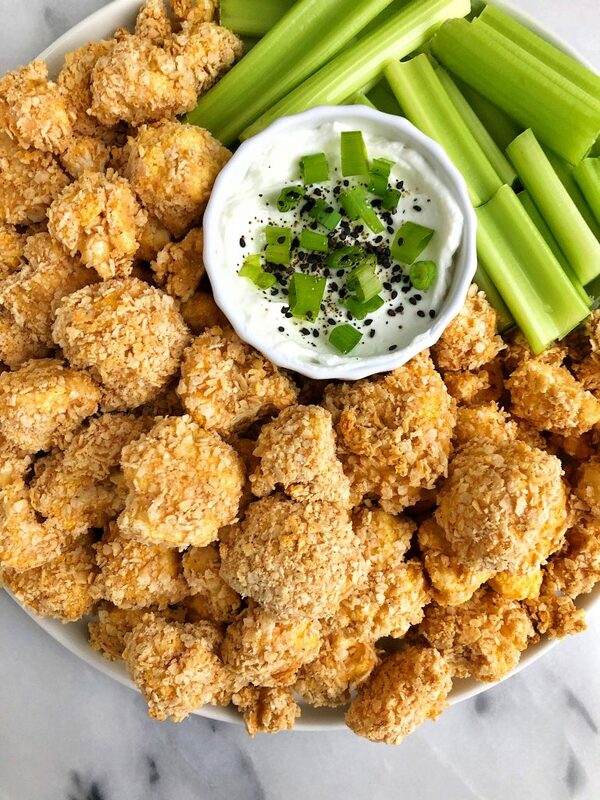 Crispy Spicy Cauliflower Bites made with grain-free, gluten-free and dairy-free ingredients for an easy and tasty Whole30-friendly veggie recipe! 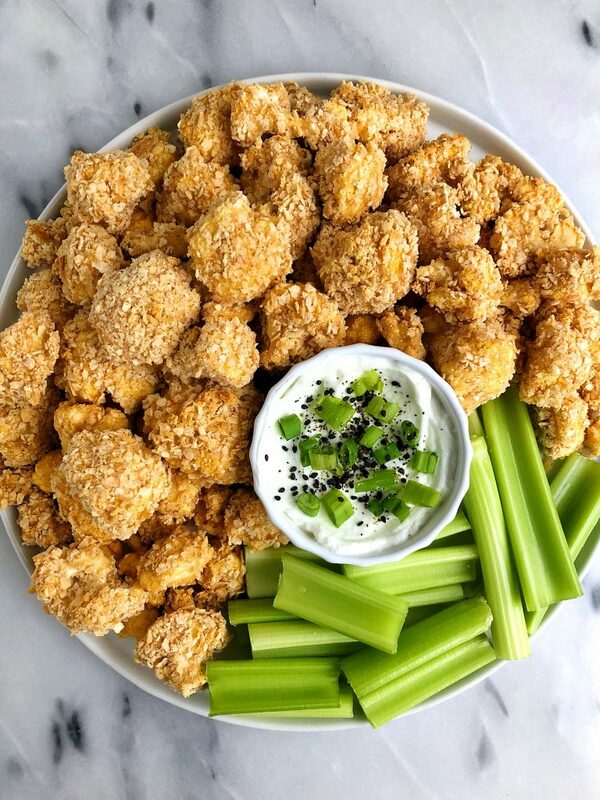 Crispy, crunchy, spicy CAULIFLOWER BITES – heeeeyyyyooo! I know what you’re thinking, “ugh great cauliflower in another form” but just go with me on this. As someone who does not enjoy eating cauliflower as dessert or a replacement for most things, there are some things we gotta give the veggie credit for. Like pizza crust, gnocchi and now these oven-baked spicy bites. I first tested this recipe when we had Jord’s family over for dinner one night. Cooking dinner for 13 people was a little intimidating at first, but we went with a chili theme and I wanted to make some type of spicy appetizer to go with the chips and guacamole for everyone to snack on. I was pleasantly surprised that these cauliflower bites ended up being a hit with the group. I was also happy to see that because I made so many of them, I wasn’t sure what we were going to do with a big a$$ platter! 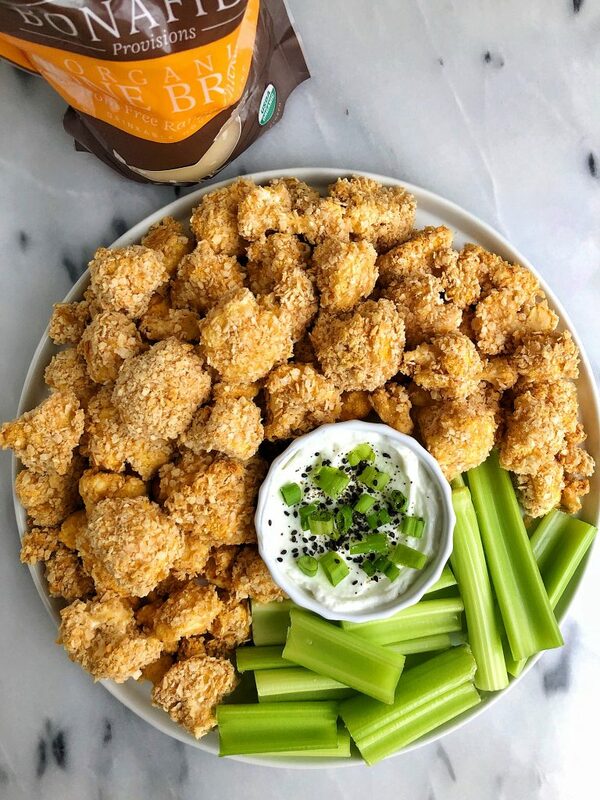 These Crispy Spicy Cauliflower Bites are likely my new favorite appetizer or veggie dish to prep. They are made with all grain-free and dairy-free ingredients. Plus they are so simple and easy to make. Dip the florets in the almond flour mixture then breadcrumb mixture and bake them for about 20 minutes. Honestly the worst part (in my opinion) is just cutting the head of cauliflower into good size pieces. The first mixture you dip the cauliflower into is so flavorful and filled with so many of my go-to’s. We are using almond and coconut flour, non-dairy milk, spices and my beloved Bonafide Provision’s Organic Bone Broth. One of my secret weapons in the kitchen. Sure, you can heat and sip it like I do daily or you can use it in various recipes to add extra flavor and nutrients to your meal. I loved using the combo of bone broth with the non-dairy milk instead of just using milk. It added extra flavor to the cauliflower and since you only use about 1/4 cup in the whole recipe, you can heat and sip the rest of the bag while we wait for these bad boys to bake. I cannot wait to hear what you guys think of this recipe! Don’t forget to share over on Instagram if you make them. And if you are craving some more recipes with bone broth, here are a few of my faves: Homemade Bone Broth Ramen Bowls, Easy Sweet Potato Veggie Taquitos and Whole30 Almond Butter Thai Noodles. Serve with any dips desired! I love using this ranch and this honey mustard. Thank you Bonafide Provisions for sponsoring this post! HI, hi! Congrats on baby Ezra! I just tried to make these and they didn’t turn out at all like yours. they look dry?? could you advice d me on what to do? LOVE all that you do!!! Enjoy that baby!!! I have 4 and 6 yr old boys and adore being a boy mom. my best advice is they probably won’t remember all the things you do, but they will remember how they felt. And those feelings of love, warmth, support, all of those feelings will stick and make them who they are.